Left: Fluoreszence image of liver cell micro tissue (green: cytoskeleton, blau: nuclei) with silica nanoparticles (magenta) located at the border of the micro tissue. Right: Elektron microscopy image of a liver cell drop. Individual nanoparticles are visible in the outer rim of the cell drop (white in detail on top left). With the aim of developing safer nanoparticles for biomedical applications, scientists of the group Nano-Cell Interactions at INM – Leibniz-Institute for New Materials and Pharmacelsus GmbH in Saarbrücken have studied a three-dimensional liver cell model. The model allows analysis of biomarkers in combination with information on penetration depth of the particles into the tissue. Therefore it is better suited for nanoparticle testing and development than conventional two-dimensional cell models, where cells are growing as a single layer. Artificial nanoparticles provide novel possibilities for biomedical applications. It is important to identify possible risks early in the developmental process. As many drugs and metabolites are catabolized in the liver, the organ plays an important role for testing new biomedical products. ″Nanoparticle-based contrast agents are injected directly into the blood and are eventually transported to the liver. For this reason we want to use advanced cell culture models of the liver for our savety assessments″, says Annette Kraegeloh, leader of the research group Nano-Cell Interactions at INM. Classical 2D cell culture models behave differently than their 3D counterparts. „If we cultivate the liver cells as so called micro-tissues – small spheres with a diameter of about half a millimeter – they produce a protein that covers bile ducts in the liver. Moreover, the gene expression for enzymes that metabolize drugs is increased. They are therefore better suited as a model for the organ than the 2D model, where only one layer of liver cells grows on a plastic surface“, explains Jana Fleddermann, first author of the now published study. The 3D model allows the researchers to determine how deep the nanoparticles are penetrating into the tissue – another advantage of the micro tissue model compared to commonly used 2D models. The scientists at INM and Pharmacelsus GmbH tested the micro tissue model with silica particles (SiO2) with a diameter of 100 nm. Silica nanoparticles are a promising material for applications in drug delivery, biosensing and as carrier for contrast agents in medical imaging. The particles were loaded with a fluorescing dye in order to make them visible under the microscope. The maximum penetration depth measured was 20 µm (about 3 cell layers). The silica particles did not harm the cells and did not interfere with tissue growth and cell behavior in a perceivable way. To further improve safety assessment of nanoparticles, different cell types that occur in the liver should be grown together to develop an even more realistic cell culture model. Background: The work was funded by the German Federal Ministry for Economic Affairs and Energy, in the framework of the Zentrale Innovationsprogramm Mittelstand (ZIM)-cooperation network NanoPharm in the project ‘MORPHEUS’. The publication of this article was funded by the Open Access Fund of the Leibniz Association. The documentary “Staub von morgen” (in German) discusses potential threads caused by innovative materials. Nanomaterials are used as an example to show the importance of thorough examination of new matters to prevent dangers. The documentary has been produced by the German Federal Institute for Occupational Safety and Health (BAuA). In December 2018 a scientist from the Leibniz Institute of Knowledge Media in Tübingen, which is a partner of the Leibniz Research Alliance Nanosafety, conducted a study with nanomaterial experts at the INM. Aim of the study is to compare the comprehension and evaluation of complex and inconsistent informations. 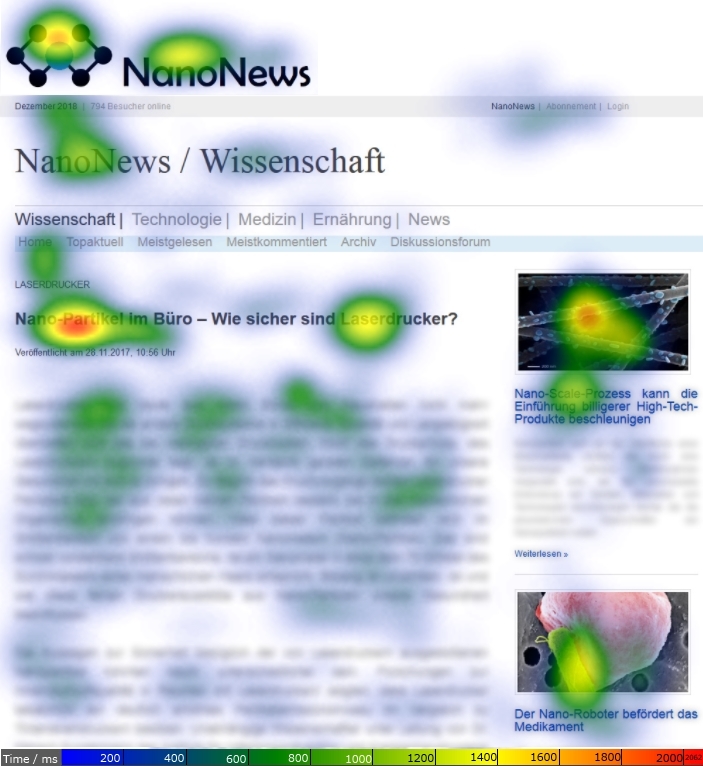 Questionnaires were combined with results from eye-tracking measurements on a text on nanoparticles. The results, that will probably be ready by summer 2019, will help scientists to communicate their work in a comprehensive manner and to avoid misunderstandings when discussing data with laypersons. During the annual meeting of the Leibniz Association in Berlin the Leibniz Research Alliance Nanosafety welcomed its eighth partner. With the Leibniz Institute for Polymer Research (IPF) we win a partner with experience in the creation of nanoparticles made of different materials and in various shapes. The Leibniz Research Alliance will also benefit from the IPF’s expert knowledge in development of nanomaterials with improved properties. We are looking forward for exciting cooperations. Recently the Leibniz Institute for Materials-Oriented Technologies in Bremen (IWT) joined the Leibniz Research Alliance Nanosafety as our seventh partner. The IWT is processing nanoparticles by reacting finely dispersed liquids. Those nanoparticles can be applied for the production of catalysts, of flexible electronic or optical coatings, and of sensors. Another important field of their research is the investigation of effects of nanoparticles on living matter. We are looking forward for a fruitful collaboration. Are nanoparticels harmless or can they play a role in the development of diseases such as Alzheimer’s disease or asthma? How do nanoparticels end up in organisms and in the environment? How can we produce nanoparticles that combine save use and the desired properties for industrial applications? Which are the legal frameworks necessary to achieve this? Those and other questions are discussed by international experts at this years Nanosafety. The conference takes place in Saarbrücken from 11 to 13 October 2017. On 11 October the scientists will discuss possible environmental effects of nanoparticles. A model will be presented that allows estimations of the nanoparticles or nanomaterials impacts on the environment. Different aspects, such as life cycle, transport and transformation are considered. Further, the so-called safe-by-design principle is discussed: the risk of nanoparticles is to be minimized already during the production process. Methods for detection, characterization and verification of safety of nanoparticels are presented by the experts. ‘Many everyday products contain nanoparticles. Examples are protective coatings on your laptop, glasses or ID cards, touch screens, sunscreen, and medical products. We aim for the best possible use of the nanoparticles; that is why the safe-by-design prinziple is of such great importance.’ explains Annette Kraegeloh, coordinator of the Leibniz Research Alliance Nanosafety. Further, the researchers look into possibilities of employing EU-wide standardized methods to evaluate nanoparticle effects. The question that stands central on 12 October is if certain nanoparticles can be detrimental to nervous tissues. The complex question of neurotoxicity is approached by using different models that mimic living organisms and that are thought to replace animal tests in the future. The experts of the Leibniz Research Association Nanosafety from France, Switzerland and USA are for instance assessing if and how nanoparticles made of manganese or diesel exhaust particles can affect organs. Other of the day’s subjects are the presentation of nanoparticle-fabrication methods and the imaging of cell-particle interactions. On 13 October a series of presentations on effects and mechanisms of action of various nanoparticles is closing the conference. One topic will for instance be how nanoparticles act in case of pre-existing health issues.